North Miami Beach - The great-grandchild of a Holocaust survivor has won second place in the 2019 Holocaust Reflection Contest, High School Art category. The student artist, Danit Weitzman, is in Grade 11 at Scheck Hillel Community School. 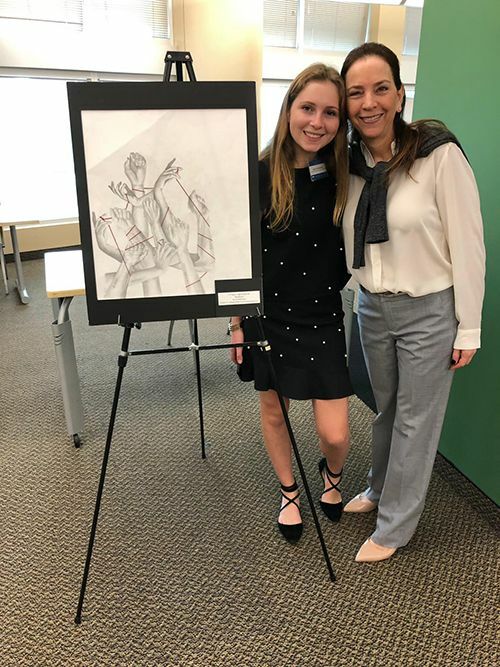 She was inspired by her great-grandfather to create the winning piece, “Resilience,” in her Advanced Placement (AP) Studio Art 3-D Design class at Scheck Hillel. Danit’s AP Art teacher, Edith Shlesinger, was also recognized for mentoring and supporting her student’s work. The contest is hosted by Nova Southeastern University and sponsored by the Holocaust Learning and Education Fund, Inc. Danit’s artwork was inspired by her great-grandfather's testimonial. Words from Danit Weitzman, Grade 11: From my great-grandfather’s testimonial I learned about the resilience of the Jewish people and the fact that we derive strength from one of the most tragic episodes of humanity. As a nation, we are connected by the obligation of lifting our Jewish identity and honoring the legacy of all six million Jewish lives taken, including 54 members of my family who perished and today are only present in my great-grandfather's fading memories. My great-grandfather carried his younger brother through their escape from the march of death. Chased by bullets and bitter cold, they returned to their abandoned home, only to realize that they were the only two remaining from their family. The sibling who hung on my great-grandfather’s shoulders went on to develop Israel’s drip irrigation system and turn arid deserts into fertile land. This artwork captures a bond between two brothers, the thriving state of Israel, and the Jewish nation which has and will always be tied together with a thread of resilience. “Danit is an amazing student and creative artist, I am so proud of her,” said Edith Shlesinger, Scheck Hillel AP Art teacher and Danit’s mentor. Arts education is a core component of Scheck Hillel’s curriculum from early childhood through high school. Instruction is offered through a framework of educational standards in a variety of disciplines, including music, theater, and the visual arts. Scheck Hillel arts educators are highly-trained instructors who spark a lasting appreciation for artistic expression. As students make personal choices for their creative outlets, they are able to deepen and continually improve their practice. Contest winners are awarded cash prizes and are invited with their families to a weekend of activities, including a private tour of the Craig and Barbara Weiner Holocaust Reflection Resource Center. 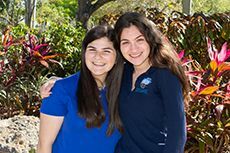 Danit and Ms. Shlesinger were recognized in a ceremony on March 17th in the Fort Lauderdale/Davie campus of Nova Southeastern University. 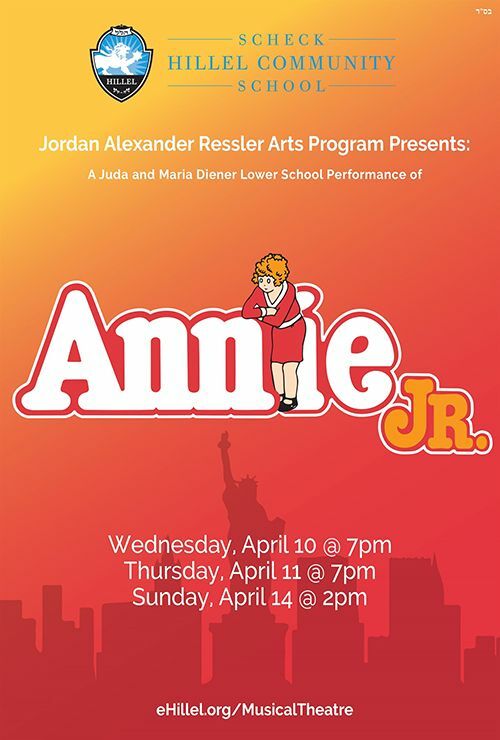 NORTH MIAMI BEACH – Scheck Hillel Community School’s Jordan Alexander Ressler Arts Program presents “Annie Jr.” Let the student cast and crew take you and your family on plucky orphan Annie’s quest to find her parents in one of the world’s best-loved, award winning musicals! Musical Theatre Production of “Annie Jr.” directed by Anthony Campisi with musical direction by Angelica Losada and choreography by Ashlee Brown. This production is dedicated to Judith Lindenfeld Gorsd, z"l. A beloved friend of Scheck Hillel Community School who named our Jordan Alexander Ressler Arts Program for her grandson, Jordan Alexander Ressler, z"l, sparking a love for the arts among a new generation of students. About Scheck Hillel Community School Scheck Hillel Community School educates and inspires students 18 months-Grade 12 to become exemplary global citizens with enduring Jewish identity and values through an individualized college preparatory curriculum highlighted by Design/STEM, Capstone, college dual enrollment, arts, athletics and community service. Its 14-acres include a 115,000-sq.-ft athletic complex with academic expansion plans. Set within a nurturing, diverse community, Scheck Hillel is one of the world's largest Jewish community day schools and a National Blue Ribbon School of Excellence. For more information about Scheck Hillel Community School or to arrange a visit to the school, please contact our Admissions office at 305.931.2831x173 or write to admissions@eHillel.org. 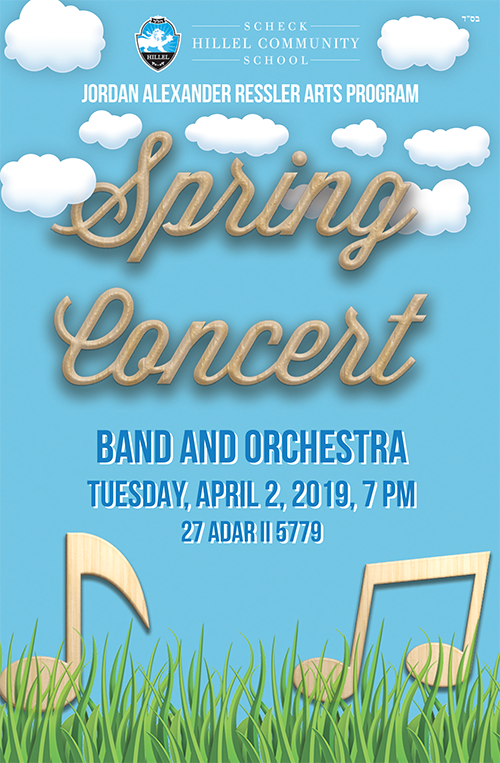 Scheck Hillel Community School's Jordan Alexander Ressler Arts Program presents A Spring Concert, featuring Scheck Hillel's Juda and Maria Diener Lower School strings and chorus and Ben Lipson Upper School band and orchestra. Eight ensembles will be presented. This concert is dedicated to Judith Lindenfeld Gorsd, z"l. A beloved friend of Scheck Hillel Community School who named our Jordan Alexander Ressler Arts Program for her grandson, Jordan Alexander Ressler, z"l, sparking a love for the arts among a new generation of students. 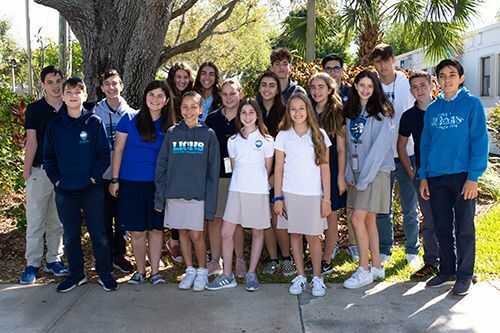 NORTH MIAMI BEACH – A record 22 Scheck Hillel Community School students received a Superior rating - the highest possible - for solos performed in the 2019 District 20 Solo & Ensemble adjudication on January 31, 2019. In all, 32 Scheck Hillel students earned a Superior, Excellent or Good rating in the adjudication. Scheck Hillel hosted the event for its own members of the Band program as well as peers from Miami Country Day School. As part of this nationwide program, student instrumentalists select and prepare pieces from an approved list of works, performing their solos with piano accompaniment before a State-certified adjudicator. Each of the following students earned a Superior rating: Daniel Abbo, Grade 9 (clarinet); David Almog, Grade 7 (trumpet); Leonardo Bentata, Grade 10 (trumpet); Malvina Dimitri, Grade 9 (flute); Ellie Esquenazi, Grade 7 (clarinet); Eli Gelb, Grade 11 (tenor saxophone); Eva Gelb, Grade 7 (clarinet); Sadie Lemmer, Grade 6 (flute); Zachary Lemmer, Grade 9 (flute); Noah Levine, Grade 8 (alto saxophone); Julia Luck, Grade 7 (flute); Amit Miara, Grade 9 (flute); Orel Mizrahi, Grade 8 (mallet percussion); Valerie Nichols, Grade 6 (flute); Eduardo Novodzelsky, Grade 8 (french horn); Michael Rafalskyy, Grade 10 (baritone); Emily Rodman, Grade 12 (clarinet); Benjamin Ratzker, Grade 11 (alto saxophone); Hannah Stern, Grade 9 (trombone); Eyal Vaxman, Grade 7 (trumpet). For the second consecutive year, Joi Alon, Grade 11 (alto saxophone) and Jayme Podgorowiez, Grade 12 (clarinet) each received a Superior rating and played a level of difficulty that advances them to the State level of Solo and Ensemble. State Solo & Ensemble will be held March 20-March 24, 2019, at Seminole High School in Sanford. Performance dates are to be assigned. Each of these nine Scheck Hillel students each earned an Excellent rating: Jonathan Abbo, Grade 12 (alto saxophone); Michael Berenstein, Grade 11 (alto saxophone); Salomon Delarosa, Grade 8 (trumpet); Raquel Dimitri, Grade 12 (trumpet); Eitan Garzon, Grade 8 (clarinet); Arie Lisker, Grade 7 (trombone); Yitzhak Lopez, Grade 6 (alto saxophone); Danielle Waijman, Grade 12 (trumpet); Mirah Zack, Grade 12 (trumpet). Joshua Schmutter, Grade 11 (alto saxophone) received a Good rating. Since 2013, Scheck Hillel has hosted District 20's Thursday Solo & Ensemble adjudication to create an opportunity for South Florida’s student-musicians to participate in the adjudication and uphold their observance of Shabbat (the Jewish Sabbath). This opportunity is made possible thanks to the joint efforts of the Florida Bandmasters Association (FBA) and Scheck Hillel Community School. Arts education is a core component of Scheck Hillel Community School’s curriculum, from early childhood through high school. Instruction is offered through a framework of educational standards in a variety of disciplines, including music, theater and the visual arts. Scheck Hillel arts educators are highly-trained, nationally recognized instructors who spark a lasting appreciation for artistic expression. As students make personal choices for their creative outlets, they are able to deepen and continually improve their practice. Research has shown that an arts education enhances academic achievement and school engagement, and enriches campus life. Students make personal choices for their creative outlets while gaining respect and understanding for all fine and performing art forms. Whether a student’s passion is learning to play the violin or painting a masterpiece, there is a place for everyone in Scheck Hillel’s Jordan Alexander Ressler Arts Program. Scheck Hillel Community School educates and inspires students 18 months-Grade 12 to become exemplary global citizens with enduring Jewish identity and values through an individualized college preparatory curriculum highlighted by Design/STEM, Capstone, college dual enrollment, arts, athletics and community service. Its 14-acres include a 115,000-sq.-ft athletic complex with academic expansion plans. Set within a nurturing, diverse community, Scheck Hillel is one of the world's largest Jewish community day schools and a National Blue Ribbon School of Excellence. 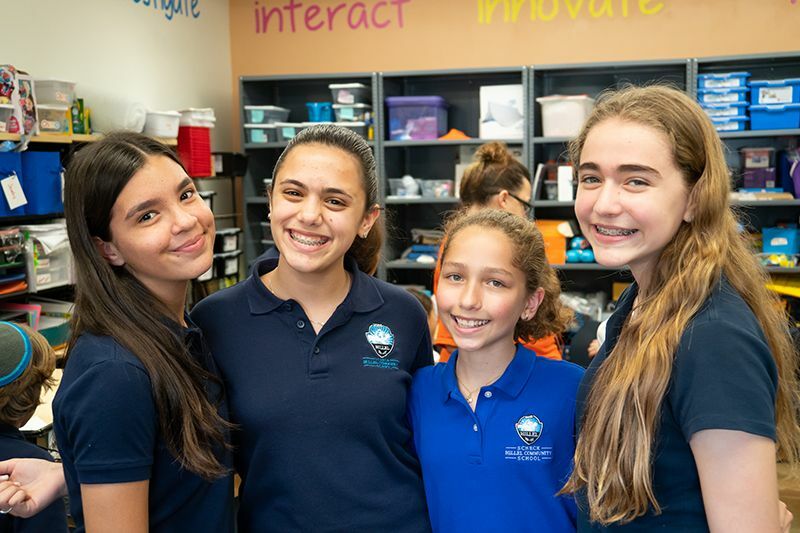 For more information about Scheck Hillel Community School or to arrange a visit to the school, please contact our Admissions office at 305.931.2831x173 or write to admissions@eHillel.org. 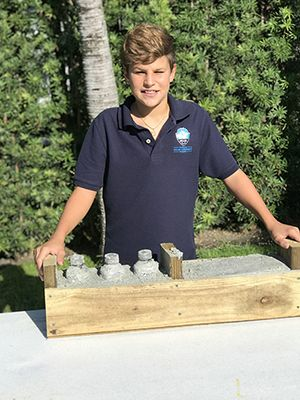 Scheck Hillel Community School Grade 8 student Andres Ruah has advanced to the 64th State Science & Engineering Fair of Florida STEM Competition with a project about energy efficiency. He is one of only 10 middle school students from the South Florida Regional Science and Engineering Fair who advanced to the State competition, which will be held March 26-28 in Lakeland, Florida. For his project, Andres built a concrete block made of cement and recycled plastic to create a more energy-efficient method of ventilation. At the February 8 Regional Science Fair awards ceremony, Ruah received a trophy and two additional special awards: the ASM Materials Award and a Broadcom Award. In addition, seven more Scheck Hillel students received gold medals and five students were awarded bronze. Regional gold medals were awarded to Michael Abbo, Andrea Berti, Sophie Gamburd, Jamie Kurzer, Jaime Mizrahi, Lee Peleg, Andres Ruah and Talya Shechter. Regional bronze medals were awarded to Daniela Assor, Ilan Brejt, Johnathan Lev-Tov, Alan Strulovic and Noah Yecutieli. Scheck Hillel’s Design/STEM curriculum starts in Early Childhood Education (ECE) and progresses through Grade 12. In ECE, Design/STEM is taught in the classroom through day to day activities in Science and project-based learning opportunities. Kindergarten-Grade 5 students also use the I Lab as a dedicated space for inspiration and innovation, designed to extend classroom learning in an environment that promotes collaboration and experimentation. In the I Lab, students engage in developmentally sequenced activities focused on Design/STEM concepts with a focus on social studies, digital literacy, coding, and robotics. In Grades 6-12, the Multimedia Maker Lab is the hub for Design/STEM learning. Scheck Hillel offers a 4-year high school Design/STEM program of hands-on laboratory courses designed to mimic work environments in the real world; applications open for rising Grade 9 students every spring. 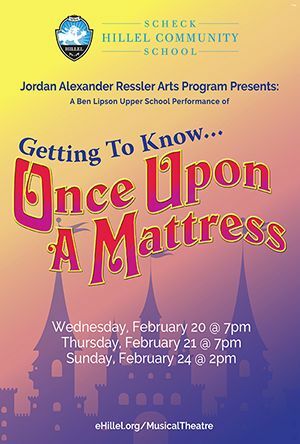 Scheck Hillel Community School’s Jordan Alexander Ressler Arts Program presents “Once Upon a Mattress.” Grade 6-12 students and crew will take you to the faraway kingdom of Queen Aggravain with this classic musical favorite for the whole family to enjoy! Musical Theatre Production of “Once Upon a Mattress” directed by Anthony Campisi with musical direction by Laura Bass and choreography by Justine Rosales. Scheck Hillel Community School’s Jordan Alexander Ressler Arts Program (Student cast and crew). Scheck Hillel Community School (19000 NE 25th Avenue, North Miami Beach, FL 33180). Purchase tickets at eHillel.org/boxoffice ($13/ticket online or $15/ticket at the door). This musical theatre adaptation of Hans Christian Andersen’s fairy tale, “The Princess and the Pea,” tells the story of a prince in search of a true princess. “Once Upon A Mattress” begins in a faraway kingdom long ago, where due to an unhappy curse, the King is unable to speak. Meanwhile, his terror-of-a-wife, Queen Aggravain, has taken over control of the kingdom. Most importantly, in an attempt to keep Prince Dauntless single, she has decreed that only the princess that can pass her test may marry her son. Further, no one else in the kingdom may marry until Prince Dauntless does. Luckily, Sir Harry is able to find an amazing princess, Winnifred the Woebegone. She instantly catches the attention of Prince Dauntless, and in the end, is able to pass the Queen's supposedly impassable sensitivity test. When the Queen still tries to prevent Prince Dauntless from marrying, he ends up standing up to her, which ends up breaking the curse on the King. Now able to speak, the King regains his rightful position as leader of the kingdom, and all is well. Hans Christian Andersen wrote more than 150 fairy tales including “The Little Mermaid,” “The Emperor’s New Clothes,” “The Ugly Duckling,” “Thumbelina” and “The Snow Queen.” More than 120 years after the publication of “The Princess and the Pea,” Mary Rodgers, Marshall Barer and Jay Thompson adapted “The Princess and the Pea” to musical theatre in 1958. 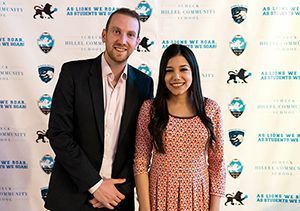 North Miami Beach, Fla.– Scheck Hillel Community School hosted its 2019 Annual Event to benefit the school’s Kulanu Scholarship Fund on Thursday, January 17. This year’s theme, Thursday Night Live, featured comedian Elon Gold, famous for his roles on TV and his recent Netflix special. Nearly 400 supporters attended the event, including community leaders. Event committee members included Susy and Larry Abbo, Colette and Mark Feldman, Valerie and Alexander Friedman, Eliane and Lando Kravetz, Evelyn and Isaac Marcushamer, Jennifer and Daniel Naim, Shana and Jacob Russo, Tammy and Jonathan Saporta, Betina and Jack Strimber, and Viviane and Alex Wolak. During the event, a video showcased the stories of two families who were empowered by Kulanu, and conveyed how this fund is crucial for the continuity of Jewish education. Nearly 20% of Scheck Hillel students receive tuition assistance through the Kulanu Scholarship Fund, which is funded solely by donors. Elon Gold visited the school before the event and spoke to Scheck Hillel’s high school students about life in the entertainment industry while maintaining a strong Jewish identity. It was an inspiring - and entertaining! - opportunity. Elon Gold is famous for starring in FOX’s ‘Stacked’ and NBC’s ‘In-Laws’. He has made appearances on ‘The Tonight Show’ and had a recent recurring role on the hit show, ‘Bones’. He was a writer/performer on ABC’s ‘The Dana Carvey Show’ and a guest on ‘Frasier,’ ‘The Mentalist,’ ‘Chappelle’s Show,’ among others. About CASE District III CASE District III advances and supports educational and professional institutions in the southeastern United States as part of the Council for Advancement and Support of Education. Designing the Future is partially funded by two grants. The Women’s Impact Initiative of the Greater Miami Jewish Federation will support the program’s faculty, a project exhibit and the opportunities for students to present at the International Society for Technology in Education (ISTE) conference in Philadelphia and the FETC: Future of Education Technology Conference in Orlando. The Technology, Education, Research & Redesign Alliance (TERRA, Inc.) grant will expand Scheck Hillel’s Multimedia Maker Lab beyond traditional Design/STEM areas of study with technology and equipment for fashion design, robotics, art and jewelry production. Scheck Hillel’s I Lab is a dedicated space for inspiration and innovation, designed to extend Kindergarten-Grade 5 classroom learning in an environment that promotes collaboration and experimentation. In the I Lab, students engage in developmentally sequenced activities focused on Design/STEM concepts with a social studies focus. In Grades 6-12, the Multimedia Maker Lab is the hub for Design/STEM learning. Scheck Hillel offers a 4-year high school Design/STEM program of hands-on laboratory courses designed to mimic work environments in the real world. Inquisitive learners who are tenacious creative problem-solvers may apply to the program for Grade 9. 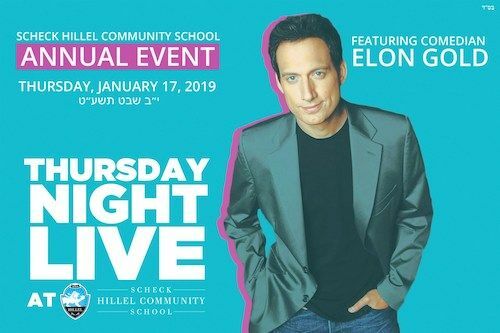 Enjoy a fun night full of laughs featuring comedian Elon Gold at Scheck Hillel Community School’s 2019 Annual Event: Thursday Night Live. Elon Gold is famous for starring in FOX’s ‘Stacked’ and NBC’s ‘In-Laws’. He has made appearances on ‘The Tonight Show’ and had a recent recurring role on the hit show, ‘Bones’. Elon was a writer/performer on ABC’s ‘The Dana Carvey Show’ and has guest starred on ‘Frasier’, ‘The Mentalist’, ‘Chappelle’s Show’ among others.